We have taken a break from caulking and sealing leaks since it appears we may have corrected most of them. We have been doing our part to stimulate the economy and spent a whole bunch of money on new equipment so it is time to install some of it. 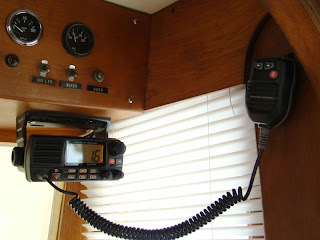 The original VHF on the boat is an older Standard unit and although it worked, well we needed a VHF at the lower helm as well as the flybridge. Buying a new radio and putting it on the flybridge would only cost slightly less than buying the radio and installing a remote mic and would be a simple install. 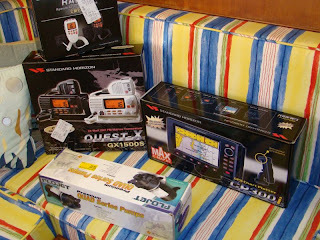 In addition, the VHF would only need one antenna and no splitter. I like the Standard Horizon equipment because past experience has shown it to be dependable, well built, easy to interface, and very user friendly. It has all of the features we need and not loaded with features we will never use. 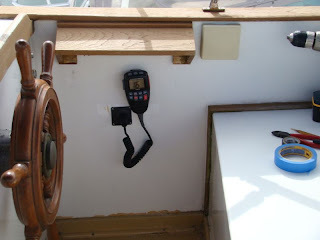 The Standard Horizon Quest VHF at the lower helm and the remote mic at the bridge make a great solution and will connect to our Standard Horizon Chartplotter at the helm to give us GPS capabilities for the DSC portion of the radio. Running the single cable to the flybridge was a snap and the remote mic gives us full control of the radio from that location. One cool feature is the intercom setting which allows you to speak to the person at the other station. Since we have finally put the boat delivery behind us we have been working on the new boat every day from morning to evening. We only have a few weeks before we need to head south. We have a commitment in the Bahamas so really want to be under way by December 1st and still have lots of work to do. We have ordered new equipment, a VHF radio with remote mic for the flybridge, a wash down pump for the anchor, a new windlass and a whole lot more. But before any of that gets installed we have a few other priorities.